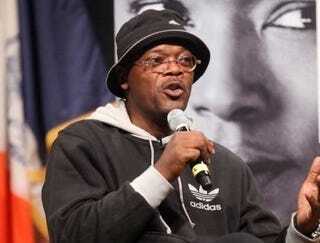 Samuel L. Jackson, 63, says longevity is the secret to how he became the highest-grossing actor of all time. He has appeared in more than 100 films since 1972, and moviegoers would have a hard time finding him in the role of a virtuous man, according to the New York Times. Before “The Mountaintop” opened on Broadway last fall, there were rumors that this fictional account of Martin Luther King Jr.’s last night before his assassination would present him as a flawed man, one who drinks and flirts with a motel maid. Kenny Leon, the director, told me recently, however, that he never would have had anything to do with something “that destroyed the iconic nature of Dr. King.” In fact, he said, when he first read the play, he realized that its innocently childlike King could be played only by “a sensitive actor bigger than life” — his friend Sam Jackson.